Have you met your Twin Flame yet...and if not, do you believe you have one? What are Twin Flames (or Twin Souls) anyway? For those who believe that each of us is linked to a unique destiny or life purpose, the answers to both of these questions can be both yes and no. Often when we begin to walk that destiny path we encounter individuals who seem to be holding up a mirror to our souls. Such meetings can cause us to throw all caution to the wind. As if sleepwalking, we start to follow this romance wherever it seems to be leading us—regardless of the consequences. Your twin flame becomes a unified field of sublime self-fulfillment. This exactly what happened between Julie Cassaway and García García in Solara Vayanian’s new novel, The Stars Gave Passion. What appears to be a simple romance novel becomes layered with symbolism as the story unfolds. In The Stars Gave Passion, Solara Vayanian brings forth a richly woven tapestry of the self emerging from its innocence and reaching out for a deeper understanding of who she is and how she will answer to the deepest longings of her higher self. With wisdom and compassion Vayanian demonstrates that "it's all about choices." We manifest the opportunities in order to grow from the consequences of our decisions. This is a love story and spiritual quest that you will remember forever. 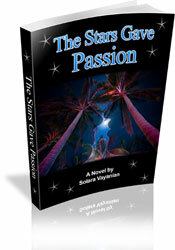 Published by Dandelion Books, The Stars Gave Passion (ISBN 978-1-934280-73-7) is available as a downloadable ebook. Vayanian is also the author of Time out Mind, a novel about the dramatic demise of Atlantis, an ancient civilization known for its advanced culture and spiritual supremacy. Time Out of Mind is available in hard copy and E-Book. In addition to being a prolific novelist, Vayanian is a professional dancer. She is founder of Winged Fire International, a multi-level organization based on education and healing through the arts.